This research project was funded by the research initiative „Zukunft Bau“ of the federal institute for research on building, urban affairs and spatial development (Reference number: II 3-F20-13-3-001/SWD-10.08.18.7-13.12). Future Smart Home systems require Plug&Play functionalities to allow easy installation of devices in buildings without technical knowledge and at low cost. The technology will also provide open interfaces for manufacturers to ensure interoperability. During the research project a suitable solution for the Smart Home has been designed and the integration of existing systems was evaluated. Within the project, the state of the art has been thoroughly analyzed. Therefore, the fundamentals of communication have been studied, which are necessary for the implementation of the project. Subsequently, the technologies used in classical building automation and the latest developments in Smart Home were analyzed. In order to not completely replace old technologies by new ones, the integration of legacy technologies in Web Services environments has been studied as a first aspect of the project. A complete switch to a new technology is associated with higher costs, since all existing installations must be completely modernized in this case. Therefore, a gradual modernization would be a cost-effective solution. In this case, only a few devices are replaced or new equipment is installed. The existing devices will continue to be used and integrated into the new installation. 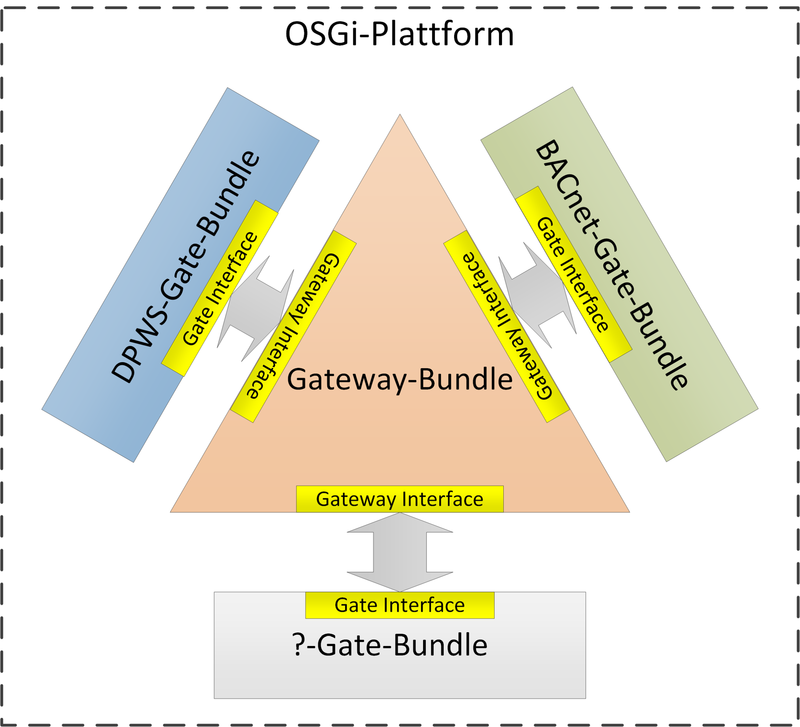 To achieve this goal, old devices must be able to communicate with DPWS devices by using a gateway. 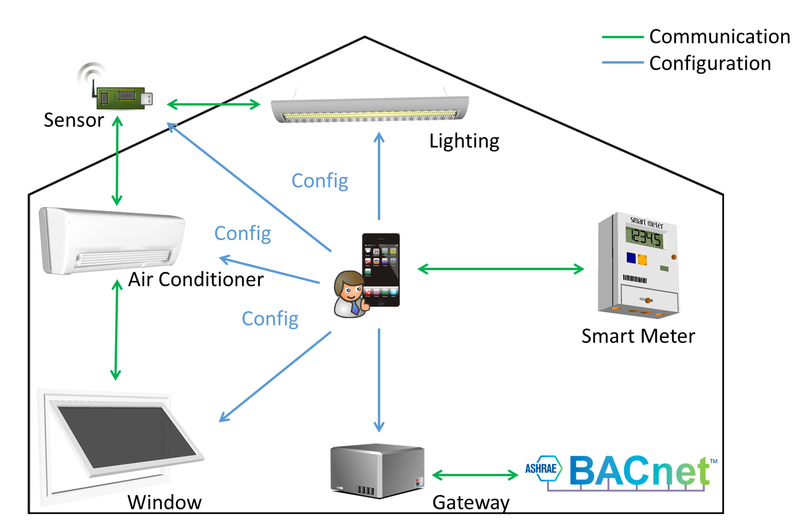 This is shown by the example of the BACnet protocol, because several gateway implementations of BACnet to other protocols such as KNX, LON and ZigBee already exist (see fig. 1-2). As a further aspect of the project, Smart Metering in Smart Home was investigated. Smart Metering is one of the fundamental pillars in Smart Home, because users want to control not only devices, but also obtain information about the house such as to receive daily consumption of electricity, water or gas. Such information is already caught up in most cases by the meters, however, it cannot be retrieved due to the lack of communication unit. This problem should be solved by Smart Meters. The introduction of Smart Meters in Germany, however, has slowed down. This raises the question of how an implementation of Smart Home in the near future is possible without the widespread use of Smart Meters. One possibility would be to supplement existing meters with a low cost communication unit. However, conventional meters are usually mechanically, thus an extension of the functionality is difficult. Consequently, the reading of the meter would be an additional task of the communication unit. 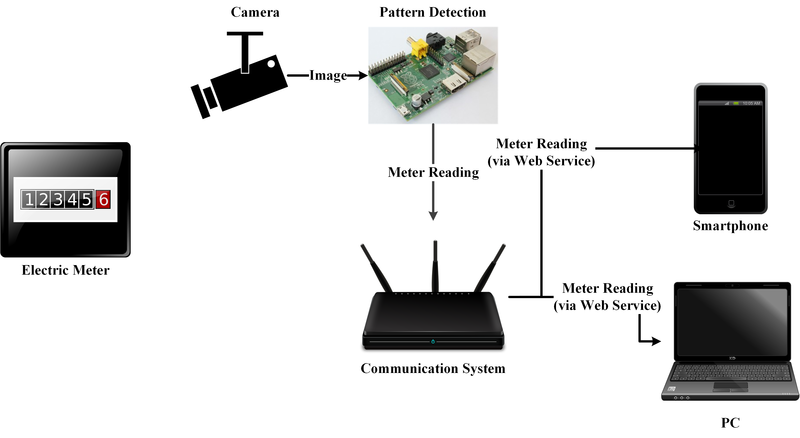 To create a low cost solution, the communication unit should be able to read any kind of meter readings and transmit the read value via a communication interface (see fig. 3). One of the goals of this project was therefore to develop a cost-effective system that reads the meter reading of an analog electric meter at short intervals and makes this data available via a Web Service on the local network. This allows to offer the user a fully functional and cost-effective upgrade for old meters to Smart Meters. Furthermore, it can be quickly implemented and also accelerate the introduction of Smart Home significantly. Another aspect of the project was the user-friendly configuration of Smart Home devices by the user. For this purpose, a concept was developed, which enables the remote configuration of these devices. The user can connect devices to each other and set up rules for their interaction by using an end device (smartphone, PC). The communication takes place solely between the devices and the end device (see fig. 4). This is an advantage of the distributed configuration over a communication based on a central hub, which is often used in proprietary solutions. The absence of a data model in DPWS represents a hurdle for the manufacturer-independent communication between DPWS devices. Same devices from different manufacturers may require different data for the configuration. To overcome this hurdle, a database has been set up on the Internet, which enables the exchange of device description data and the establishment of standards for such data of specific device types. Finally, a demonstration environment was created, illustrating the concepts and mechanisms, which were developed and implemented in this project (see fig. 5). It has been shown that Web Services allow a user-friendly installation and use of Smart Home devices from different manufacturers via open interfaces. The investigations have shown that already installed legacy technologies can be integrated via gateways and conventional, already existing electricity, water and gas meters can be upgraded cost-effectively to Smart Meters. Additionally, a decentralized solution for configuring DPWS devices was designed. Therefore, Smart Home devices can be decentralized and user-friendly interconnected by a smartphone application to implement value-added applications.